Woof Megaphone Broadcast / Leisure Time / Etc. 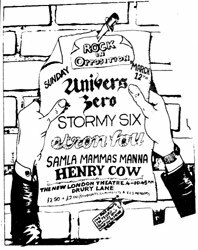 "as a musical intervention - to bring into the UK a whole range of records by groups & musicians whom we thought excellent & yet who were completely unknown here. Then - as now - we were only concerned with the quality of the music; & epiphenomenally with supporting independents - for many of the most interesting groups could only make their work available by pressing & manufacturing themselves. This remains the case. We are not ever concerned with commercial viability, only with distributing the music we feel close to." By forming distribution networks, and by exemplifying a pattern for similarly inclined musical ventures, a set of affiliated labels emerges representing a large cross section of experimental, unusual and innnovative music throughout the world. While most of these labels are fully distinct operations, they share a common musical ethic and an accommodating attitude, yielding excellent music for both the listener and the musician. 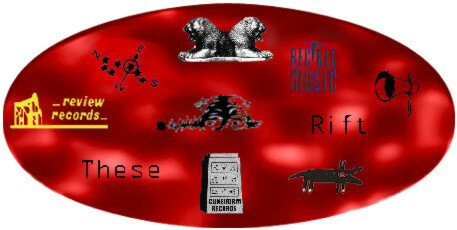 Other sites on the web containing information about this and related musics. Also contains as many of the links from this site as I could ferret out and alphabetize! Squidco is our own mail-order store that carries many of the titles on this site, including a complete catalog of ReR titles, RIO sections, and extensive NY and Improv releases. Recommend Records is a mail-order distributor of the kinds of music you'll find cataloged on this site. Chris Cutler reviews all releases, and the basic idea is that they only carry releases that he 'recommends', though their of-interest section is extensive. Verge Music Distribution is a Canadian mail-order shop, and has a large and interesting catalog of releases. Wayside Music, a well developed and extremely reliable mailorder source for innovative music, is the US distributor of ReR titles. Downtown Music Gallery (212-473-0043) is Bruce Gallanter's NYC record store specializing in the Downtown NY scene, avante, jazz, and a myriad of eclectic musics. Notes and comments on this site. This is the 5th year of this discography (1999) and I'm still missing quite a bit of information, beside the continuing problems of staying current. Anyone that can help fill in the gaps, no matter how small the addition, receives my undying gratitude and a comment above. Which isn't much, I know :) but it would be very helpful! Please email zampino@squidco.com with any information in any form: note, list, blurred graphic image, you name it- and I'll reformat it for the discography. Comments, corrections and suggestions are always welcome.